Judge Peter Sakai, Champion of Children & Families to narrate Peter & the Wolf with the San Antonio Symphony with Conductor David Masur, October 4th @ 2:30 p.m. @ Laurie Auditorium @ Trinity University. Tickets: $16, Children undr 18 is $8. 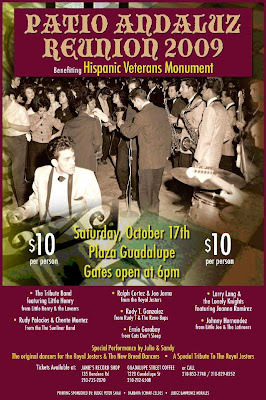 Patio Addaluz Reunion 2009 benefitting Hispanic Veterans Monument, Saturday, October 17th @ Plaza Guadalupe. Gates open @ 6 p.m.
You are invited to attend a History Making Conference in San Antonio. Join with Protestants and Catholics from across the city! "The Church of the City Conference" presented by: CityPact and The Catholic Center for Charismatic Renewal International, National and Local Speakers on Transformation. Saturday October 3rd, Two Sessions 9 a.m.to 12:30 p.m. & 6:30 p.m. The San Antonio Christopher Columbus Italian Society is proud to announce our celebration of the 1492 arrival of Christopher Columbus to America. All our events will be held at the Christopher Columbus Italian Hall, 201 Piazza Italia. We are located near the intersection of IH 10 and Martin Street. Log onto our web site for information and directions: http://www.ccis-satx.org/Sunday, October 4th @ 11 a.m.- We will kick off our week long celebration on Sunday, October 4th after the 10 a.m. Mass with a procession from the San Francesco di Paola Catholic Church to Columbus Square Park. The procession will lay a wreath at the Christopher Columbus Statue where the Mayor will present the proclamation. Thursday, October 8th @ 3 p.m.- The Christopher Columbus Italian Society Ladies Auxiliary (CCLA) will be making the irresistible Italian Cannoli and Pizzelle pastries. Delivery of materials and special ingredients -Saturday, October 10th @ 9 a.m. - The mixing, rolling and frying of our Genuine Italian Meatballs. The Ladies will be rolling and the Men will do the mixing and the frying. If you would like to volunteer, we can use all the help we can get, just show up. Saturday, October 10th @ 8 a.m. - The cooking of the Genuine Italian Spaghetti Sauce. Over in Columbus Park we will have hundreds of Pumpkins and there will be a pumpkin carving contest. Sunday, October 11th @ 11 a.m. - To will top off the celebration, Sunday, October 11th after 10 a.m. Mass we will serve the Genuine Spaghetti and Meatball Dinner. The Italian community will serve spaghetti and meatballs from 11a.m. to 5 p.m. Homemade Italian desserts such as cannoli, pizzelle, and spumoni ice cream will be available. Carry out is available (don’t forget your container). During the day long event there will be music, Italian Dancers, Antique Car Display, Arts & Craft Booths, and a Bocci Tournament. There will also be special activities for children including a moonwalk, balloon characters and face painting.Proceeds from this event will go to fund our many charitable contributions. Fundraiser for Paul Talamantez (photo) for Judge. Paul Talamantez for 285th District Judge for Bexar County, Thursday, October 1st @ 5:30 p.m. @ the Law Offices of Rey Diaz. More details forthcoming. 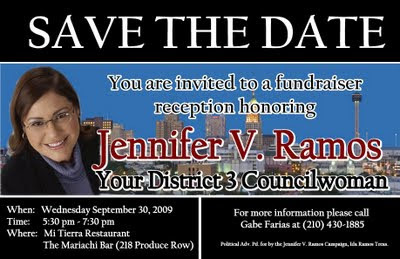 You are invited to a fundraiser reception honoring Jennifer V. Ramos, your District 3 Councilwoman, Wednesday, September 30th from 5:30-7:30 p.m. @ Mi Tierra Restaurant, 218 Produce Row. For more information call Gabe Farias @ 210-430-1885. You are invited to my campaign kickoff/fundraiser for the 227th District Court, Oct. 22nd at the West Avenue Panchitos from 5:30-7:30 p.m. More details to come. October 2nd-2nd Mental Health Legislative Symposium, Friday, Oct. 2nd from 10 a.m.-2 p.m. @ the Menger Hotel, Ballrooms A &B, 204 Alamo Plaza. 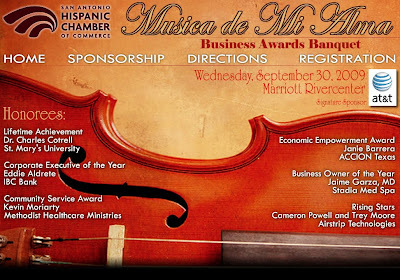 RSVP: Frances Carreno: 731-1300, X-670. 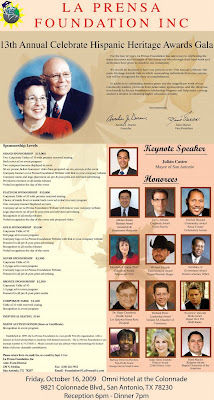 October 2nd, 3rd, 4th-You are invited to attend a History Making Conference in San Antonio. Join with Protestants and Catholics from across the city! 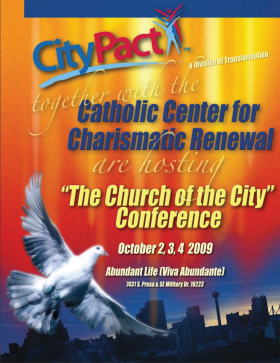 "The Church of the City Conference" presented by: CityPact and The Catholic Center for Charismatic Renewal International, National and Local Speakers on Transformation, Friday October 2nd/6:30 p.m. Saturday October 3rd, Two Sessions 9 a.m.to 12:30 p.m. & 6:30 p.m. Sunday October 4th/6:30 p.m. @ Abundant Life Church Corner of SE Military and S. Presa. October 3rd-Councilwoman Ivy Taylor will hold a District 2 Town Hall meeting, Saturday October 3rd @ Roosevelt High School located at 5110 Walzem Road. Breakfast will be served at 8:30AM and the meeting will begin promptly at 9 a.m. Several City departments will be present to answer questions and concerns from the community. October 3rd-I Love Huevos,12th Annual Huevos Rancheros Gala, & Silent Auction, Saturday, October 3rd @ Plaza Guadalupe from 9 a.m.-noon. October 3rd-Alamo City Republican Women & Joe and Joci Strauss Present the 14th Annual ACRW Retama Classic PAC Fundraiser, Saturday, October 3rd @ Retama Park 5 p.m.- 9:30 p.m. in the air conditioned Retama track-side finish-line pavilion on Retama Parkway. Cost is only $45 a person before Sept 25th and $50 a person after September 25th, includes buffet dinner, live racing and silent auction. Cash Bar 5-6 p.m.
October 4th-The SA Christopher Columbus Italian Society to celebrate the 1492 arrival of Christopher Columbus to America. All events will be held at the Christopher Columbus Italian Hall, 201 Piazza Italia. For web site information & directions: http://www.ccis-satx.org/ Sunday, October 4th @ 11 a.m.- We will kick off our week long celebration on Sunday, October 4th after the 10 a.m. Mass with a procession from the San Francesco di Paola Catholic Church to Columbus Square Park. October 4th-Judge Peter Sakai, Champion of Children & Families to narrate Peter & the Wolf with the San Antonio Symphony with Conductor David Masur, October 4th @ 2:30 p.m. @ Laurie Auditorium @ Trinity University.Tickets: $16, Children undr 18 is $8. October 4th-First Sundays for Families at SAMA: India, Sunday, October 4th, 1 to 5 p.m. Children 12 and under Free. Celebrate Diwali, India's festival of lights, with special art activities, performances & more. October 4th-St. Mary Magdalen Festival featuring Grammy Award Winner Ruben Ramos, Sunday, October 4th from 11 a.m.-10 p.m. Parade @ 1:40 p.m.
October 6th-Palm Heights National Night Out 2009 Free Food Free drinks & Great Times, Tuesday, October 6th at 5 p.m.-9 p.m. @ Palm Heights Recreation Center. October 6th-@ SAMA, Curator's Choice Gallery Talk, Tuesday, October 6th, 6 p.m. Meet at the Front Desk-Free This month's 25-minute talk will be "Gifts for Temple and Tomb: Terracotta Statues from Ancient Italy" by Jessica Powers, the Gilbert M. Denman Jr. Curator of Western Antiquities at SAMA. October 7th-Re-election Campaign Kick-off for Margaret G. Montemayor, Bexar County District Clerk, Wed Oct 7th @ 5:30 p.m. Club Giraud, 707 N. St. Mary's St.
October 7th-Bexar County Young Democrats will host Commissioner Tommy Adkisson @ its monthly meeting, Wednesday, October 7th from 6:30 p.m. - 8:30 p.m. @ Grady's on San Pedro to talk about county issues. October 8th-Fundraiser reception for Norma Gonzales for 290th district court judge and 25th anniversary of her practicing law, Thursday, October 8th from 5:30 p.m. to 7:30 p.m. @ the home of Dr. Bloyce and Edie Britton, 603 E. Olmos. October 8th-Please join us for a re-election kick-off reception in honor of the Honorable Judge Al Alonso, Bexar County Court #1,Thursday, October 8th, from 5:30 p.m.-7:30 p.m. @ Mary Lou's Restaurant, 4405 McCollough. Please make the checks payable to the Committee to Re-Elect Judge Al Alonso. October 9th-Barbara Ann Radnofsky for Texas Attorney General House Party, Friday, October 9th from 5-7 p.m. @ the home of Jo Anne and Bob Comeaux, 702 W French Place at Breeden.For more info: 210-326-2655. October 10th-Bihl Haus Arts, the Health and Healing Consortium, and Artist/Healers (doctors, nurses, etc..) from across San Antonio, "Rx Art: Take your medicine," Preview Party and Reception on Sat., Oct. 10th, 6:30-9 p.m @ the Bihl Haus Arts, 2803 Fredericksburg Rd. October 11th-CAIR Banquet & Fund-Raising Dinner, October 11th from 6-9 p.m. @ the Leon Valley Community Center, 6427 Evers Road. Congressman Paul Findley to speak along with North Carolina Senator Larry Shaw & Imam Siraj Wahaj. October 13th-Gabe Quintanilla Birthday/Campaign Kick Off Party for Judge, Tuesday, October 13th from 5:30 p.m.-9 p.m. @ the Law Office of Pat Maloney, 239 E. Commerce. October 13th-Fundraiser Reception for Judge Linda Penn for County Court 5, Tuesday, Oct 13th from 6 p.m.– -7:30 p.m @ the San Antonio Board of Realtors Building, 9110 IH 10W, Suite 105. October 14th-Judge Monica A. Gonzalez Fund Raising Reception, Wednesday, Oct 14th from 5:30 p.m.-7:30 p.m. @ Club Giraud 707 N. St. Mary's St.
October 15th-Carla Vela fundraiser for County Clerk, Thursday, October 15th from 5:30 p.m. - 7:30 p.m. @ Absolutely Everything Catering, 3915 San Pedro. October 16th-La Prensa Foundation will host the 13th Annual Celebrate Hispanic Heritage Awards Gala, Friday, October 16th @ the Omni Hotel @ the Colonnade, 9821 Colonnade Blvd. Reception begins @ 6 p.m., Dinner @ 7 p.m.
October 17th-Great Northwest Branch Library, 9050 Wellwood, 15th Anniversary Celebration & Open House, Oct. 17th from 10 a.m.-3 p.m. For more info: 684-5251. October 17th-Senatorial candidate & Houston Mayor Bill White will address the Northwest Democrats, Saturday, October 17th @ Luby's on Huebner @ 8:30 a.m.
October 17th-Patio Addaluz Reunion 2009 benefitting Hispanic Veterans Monument, Saturday, October 17th @ Plaza Guadalupe. Gates open @ 6 p.m.
October 17th-Republican Business Women Target Texas 2010 Membership Picnic, Saturday, October 17th at 10 a.m. "We mean business in 2010! Guests welcome!" @ Olmos Gun Club. October 20th-Fundraising Reception for Judge Linda Penn, Bexar County Court #5, Tuesday, October 20th @ Magnolia Gardens, 2030 N Main Ave. from 5:30-7:30 p.m. For information: 834-3954 Tom Daniels. October 22nd-Paul Vasquez invites you to his campaign kickoff/fundraiser for the 227th District Court, Oct. 22nd at the West Avenue Panchitos from 5:30-7:30 p.m.
October 22nd-San Antonio Young Lawyers Association presents 22nd Annual Judicial Reception @ Giraud Club, @ 5:30 p.m. More info to come. alfredramos@ramoslaw.comOctober 23rd-Ken Slavin in concert @ the Carver! "Tickets On Sale Starting Monday, September 21st," Friday, October 23rd @ 8 p.m. @ The Little Carver Civic Center for The Performing Arts. October 23rd-US Military Veteran's Parade Association Fundraiser, Friday, October 23rd @ Pueblo Hall, 3315 Northwestern starting @ 6:30 p.m.with the presentation of colors followed by a dance @ 7 p.m.Admission: $15 per person, reserve a table of ten for $150. For more info: Geri Metzler @ 4933141 or 732-7566. October 25th-Come join Pct. 2 Justice of the Peace Bill Donovan's Birthday Bash & re-election fundraiser @ Braun Hall, 9723 Braun Road, Sunday, Oct. 25th from 1-6 p.m.
October 26th-Mega Mixer Monday, A Professional Networking Event @ Eden Patio and Bar, 21003 Encino Commons #110, Monday, October 26th from 5:30 p.m.-8:30 p.m.
Rosario's Restaurant y Cantina, 910 S. Alamo Street. October 28th-Judge Karen Crouch's Spooktacular Event on October 28th in Fair Oaks Ranch at 7 p.m. Contributions welcome. More info to come. November 7th-Save the Date-Fundraiser for judicial candidate Dinorah Diaz. More info to come. November 12th-Please join Deborah Sandheinrich on November 12th at the Menger Hotel as she campaigns to become the next Judge of County Court at Law No. 7. Individual Ticket is $50, Friend: $ 200, Supporter: $500 and Sponsor:$1,000. For more information contact; Terrie Dougherty @ 882-8437 or e-mail deborahforjudge@hotmail.com. 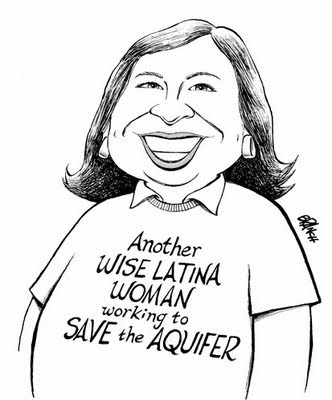 Celebrity Roast Honoring Senator Leticia Van de Putte, Thursday, October 22nd, 6:30 - 7:30 reception, 7:30 dinner will be served @ the St. Anthony Hotel, 300 E. Travis Street. To purchase tickets, visit GEAA's online store or call 210-320-1457, RSVP by October 19th. Mega Mixer Monday, A Professional Networking Event @ Eden Patio and Bar, 21003 Encino Commons #110, Monday, October 26th from 5:30 p.m.-8:30 p.m.
Join CRE8AD8 and NHPO at Mega Mixer Monday (M3) at Eden Patio and Bar for one of San Antonio’s largest networking events! The NHPO will be offering a discounted membership rate at M3 for only $15! Aldacos @ Sunset Station, 1174 E. Commerce St. 210-535-6544. Elect Judge Lawrence Morales: The only candidate for the 285th with 27 years Judicial Experience- Your name on the invitation for Las Latinas con Lawrence Morales fundraising event.- Two tickets for event- Special Recognition at the event- Name on Sponsor’s Board- Photo Opt for Web site. Donation $100 To benefit Lawrence Morales Campaign Pol.Adv.paid for by Lawrence Morales for Judge Campaign, Melissa Morales FLetcher, Treasurer, 19141 Stone Oak Parkway, Suite 104 #209, San Antonio, Texas 78258. Thank you Veterans for serving our Country. 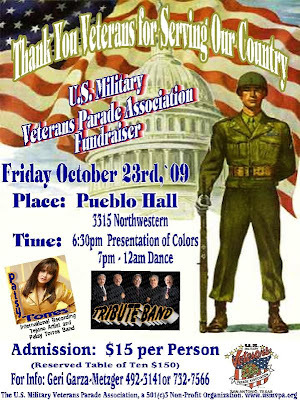 US Military Veteran's Parade Association Fundraiser, Friday, October 23rd @ Pueblo Hall, 3315 Northwestern starting @ 6:30 p.m.with the presentation of colors followed by a dance @ 7 p.m. Admission: $15 per person, reserve a table of ten for $150. For more info: Geri Metzler @ 4933141 or 732-7566. 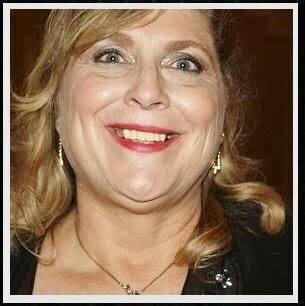 Please join Deborah Sandheinrich (photo) and her many supporters on November 12th at the beautiful and historic Menger Hotel as she continues to spread her message for positive change and as she campaigns to become the next Judge of County Court at Law No. 7. A light dinner will be served." All Elected Officials and Candidates are invited as our guests. For more information contact; Terrie Dougherty @ 882-8437 or e-mail deborahforjudge@ hotmail.com. 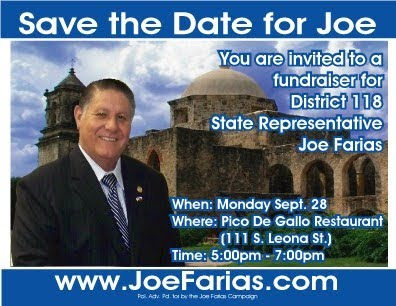 Fundraiser for State Rep. Joe Farias @ Pico de Gallo, 111 S. Leona St., Monday, September 28th from 5-7 p.m.
La Prensa Foundation will host the 13th Annual Celebrate Hispanic Heritage Awards Gala, Friday, October 16th @ the Omni Hotel @ the Colonnade, 9821 Colonnade Blvd. Reception begins @ 6 p.m., Dinner @ 7 p.m.
Great Northwest Branch Library, 9050 Wellwood, 15th Anniversay Celebration & Open House, Oct. 17th from 10 a.m.-3 p.m. For more info: 684-5251. Please join us for a re-election kick-off reception in honor of the Honorable Judge Al Alonso, Bexar County Court #1, Thursday, October 8th, from 5:30 p.m.-7:30 p.m. @ Mary Lou's Restaurant, 4405 McCollough. 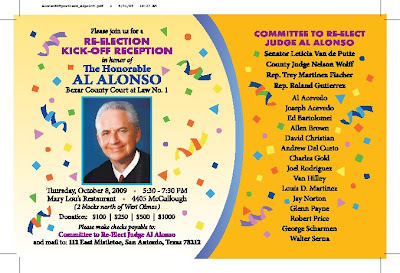 Please make the checks payable to the Committee to Re-Elect Judge Al Alonso. The Lebanese community hosted their annual gala that drew scores of elected officials and candidates as well as their own community to St. George Maronite Catholic Church on Babcock, Saturday, Septembr 26th.